Johannesburg - Botswana are fast becoming Bafana Bafana’s daily bread! 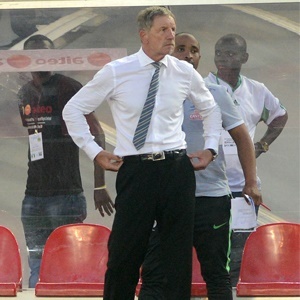 There is no better way to put it as Bafana once again showed their dominance over their neighbours – with a 1-0 win to advance to the last round of the CAF African Nations Championship (Chan) qualifiers. Bafana have beaten the Zebras three times in 18 days, once in the Cosafa Cup tournament and twice in the Chan qualifiers. It seems Botswana just can’t get it right against the South Africans, with only two victories in 13 games – and those wins came via penalties. Yesterday’s win was Bafana’s 10th over the Zebras and only one game between the two nations ended in a draw. Based on these statistics, another victory was expected from the home side and it was more a question of how many goals were going to be scored. Although yesterday’s game was academic, following Bafana’s 2-0 away victory in Francistown last weekend, the home team still gave their all. The game was a dead rubber and all Bafana had to do was honour the match, for their path to the next round was clear. They did, however, give a decent performance, with players out to impress the technical team ahead of the 2018 World Cup qualifiers in September. One player who has risen to the occasion is Kaizer Chiefs’ striker Ryan Moon, who was, once again, on the scoresheet yesterday. Moon also scored in the away leg last weekend. Despite struggling to make an impact at Chiefs, the 20-year-old was a constant menace to the visitors, carrying their defence. He should have scored his second goal of the match early in the second half, but goalkeeper Mwampole Masule came to his side’s rescue with a brilliant save. On demand, Black Leopards’ Siphelele Ntshangase also caught the eye by showing glimpses of brilliance, particularly with his passing. He made things look easy in the middle of the park as he combined well with Moon and Bonginkosi Ntuli – to the delight of the supporters. Captain Mario Booysen also had a decent game, leading from the back with aplomb and making sure nothing went through. Stuart Baxter’s biggest challenge is how many of these players will be available for the last leg of the qualifiers. Bafana will meet their nemesis, Zambia, in the last hurdle in the second weekend of next month to determine who will book a place in the Kenya tournament next year. The two back-to-back games will coincide with the start of the Absa Premiership, which could pose a threat to players’ availability, even though most of them are not regulars at their clubs. After giving their all in the two games, they will go back to their clubs with renewed energy hoping to impress their coaches. Unfortunately, most will go back to where they are not appreciated and will continue to warm the bench. Baxter would have been happy with how his charges asserted themselves and dominated the proceedings. On another day, the score-line would have been different as the home side missed chances, but, in the end, it didn’t matter.